A lawsuit has been filed seeking to overturn California’s strict new law requiring mandatory vaccines for school children. The suit filed by a group of parents and the nonprofit Education 4 All was filed in San Diego federal court on Friday, the same day the new law took effect. It says that the law violates the children’s right to an education as guaranteed under California’s constitution, and asks for a judge to suspend the law while the suit plays out. 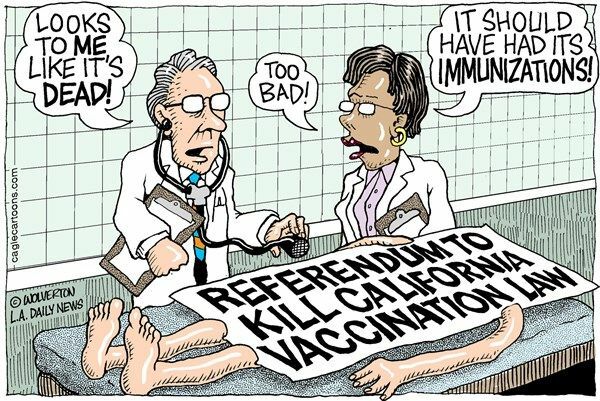 The drive to restore California’s vaccination exemptions through the state referendum process has failed. At stake was Senate Bill 277, signed into law by Gov. Jerry Brown on a wave of concern that “herd immunity” among California children was compromised by a growing anti-vaccination trend. Coauthored by state Sens. Richard Pan, D-Sacramento, and Ben Allen, D-Redondo Beach, SB277 “will require all children entering kindergarten to be vaccinated unless a doctor certifies that a child has a medical condition, such as allergies, preventing it,” as the Los Angeles Daily News summarized the law. Citing internal documentation, the Bee noted that some California counties weren’t represented at all in the final tally. “Organizers in six counties did not submit any signatures by the deadline, according to an initial survey of raw data from the California secretary of state’s office. While the organizers’ spreadsheet contains estimates for large population centers like Orange County, Los Angeles County and Riverside County, they did not have an estimate for 16 counties in addition to the six the secretary of state said did not submit signatures,” the paper reported. Although Donnelly had gained notoriety of late as an outspoken gubernatorial candidate, his charges have yet to faze supporters of the stringent vaccination mandate. In remarks to KOVR Sacramento, Pan said he supported “the right to pursue a referendum,” according to the Daily News. But Pan also told reporters he was “sure the voters of California are not interested in letting a privileged few take away the rights of all Californians to be safe from preventable disease,” the AP noted. The California Capitol often is a magnet for sign-toting protesters, T-shirt-wearing activists who deliver petitions to legislators’ offices, and members of interest groups who travel to this “temple of democracy” to make their voices heard. Rarely, though, are such routine activities accompanied by displays of real passion. But this year’s debate over SB 277, which would eliminate personal-belief vaccination exemptions for children attending public or private child care and schools, has sparked a debate that’s far testier than the typical ones that focus on budget, regulatory and even tax matters. One side depicts foes as backwoods anti-vaxxers who believe the Earth is flat, while the other depicts supporters as enemies of religious freedom and tools of the pharmaceutical industry. The high drama is easier to understand given it involves public health, people’s deeply held convictions — and, most important, their children. After a fractious debate, the California Senate passed a revised draft of the controversial bill that would largely eliminate the state’s religious and personal belief exemptions for child inoculation. With the bill on a likely track for passage in the Assembly, momentum has begun to gather for even more muscular pro-vaccine legislation. As CalWatchdog.com previously reported, state Sens. Richard Pan, D-Sacramento, and Ben Allen, D-Santa Monica, had to rewrite key passages of the bill’s language in order to head off potential constitutional challenges to its treatment of kids without the specified vaccinations. The bulk of the original bill remained intact, however, sweeping away California’s longstanding and generous rules permitting parents to keep their children vaccine-free. “Several Republican senators tried to stall the bill by introducing a series of amendments that would have reinserted the religious exemption and required labeling of vaccine ingredients,” according to the Sacramento Bee. But Democrats moved swiftly to shut them down. For some critics, barring unvaccinated children from public school remained a bone of contention. “It’s clear that a large portion of concerned parents will likely withhold their children from public schools because of their concerns or lack of comfort from the vaccination process,” said GOP state Sen. John Moorlach, according to the Christian Science Monitor. Despite the lenience built into the advancing legislation, the pro-vaccine logic that propelled it has already increased momentum for an even more assertive approach to enforcing inoculation. State senators passed a bill Thursday aimed at increasing California’s school immunization rates after a measles outbreak at Disneyland last year. The bill was approved on a 25-10 vote after a series of emotional hearings this year at which opponents called for preserving parental rights on the matter. The measure would prohibit parents from seeking vaccine exemptions for their children because of religious or personal beliefs. The measles outbreak has injected the California Legislature with a new urgency in dealing with vaccine issues. First up is a new bill, as yet without a number, by state Sens. Ben Allen, D-Santa Monica, and Richard Pan, D-Sacramento, the latter a pediatrician. But Republicans have been wary of championing residents seen as directly responsible for the outbreak of major diseases. Some GOP officeholders in Sacramento have begun to reverse their earlier support of California’s relatively broad personal belief exemption, which extends beyond a carveout for religious beliefs. Others have reaffirmed a measured commitment to both vaccination and parental choice. Now, Brown’s office has indicated the governor is open to erasing the personal belief exemption. What’s more, Boxer and Feinstein went after parents who sought modified or delayed vaccination schedules even for preschool children — a move that could unsettle the swift but fragile bipartisan consensus forming around the Pan-Allen bill. Nationally prominent California Democrats, from Rep. Maxine Waters to House Democratic Leader Nancy Pelosi, couched their language in a way that steered clear of Boxer and Feinstein’s vaccination absolutism. The office of California Attorney General Kamala Harris — who hopes to replace Boxer in the Senate — declined to answer any questions about Harris’s own stance. In 2000, the U.S. public health community finally realized the goal set in 1978 by the Centers for Disease Control and Prevention: The nation went a full year without a documented case of measles. This was a staggering achievement. Before 1963, when a vaccination to treat measles became broadly available in the U.S., the highly infectious disease was so widespread that it was practically a rite of childhood. Until then, measles routinely killed hundreds of Americans each year and afflicted thousands with encephalitis. Now each day brings fresh reminders that measles is again part of American life. The CDC’s website says that as of Jan. 30, 102 people in 14 states had contracted measles in an outbreak traced to an infected person’s visit to Disneyland. The outbreak’s epicenter is in California, where state health officials reported an ominous 68 percent surge in cases over the past two weeks.